Ever feel like you're not quite on top of your game mentally? Need to focus and be more alert? Maybe you should try Optimum Clarity. 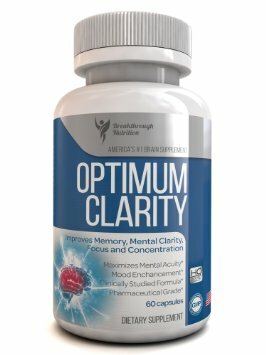 It's an all natural supplement to enhance mental clarity and focus.It's safe for all ages, moms, students, seniors,business professionals and athletes. The all natural ingredients include Ginko Biloba, St. John's Wart, Vinpocetine , Acetyl-L Carnatine , Phosphatidylserine complex , Bacopa monnieri , L-Glutamine , DMAE Bitartrate. I like to stay on top of things as a mom and grandma, so I really like this approach to mental alertness. I don't like to take harsh chemicals so knowing anything I take is all natural makes me feel so much better. Just one capsule a day. Mental clarity, improved memory and alertness is that simple.